I have been to what are considered the world`s great museums and many more, and have been, for decades, an avid and regular exhibition-goer. So it might surprise you (it even surprises me!) that one of the annual “events” that I look forward to most, one that I always find quite thrilling, consists exclusively of hundreds of white paper “canvases”, worked on in black or (much more rarley) gray ink ! 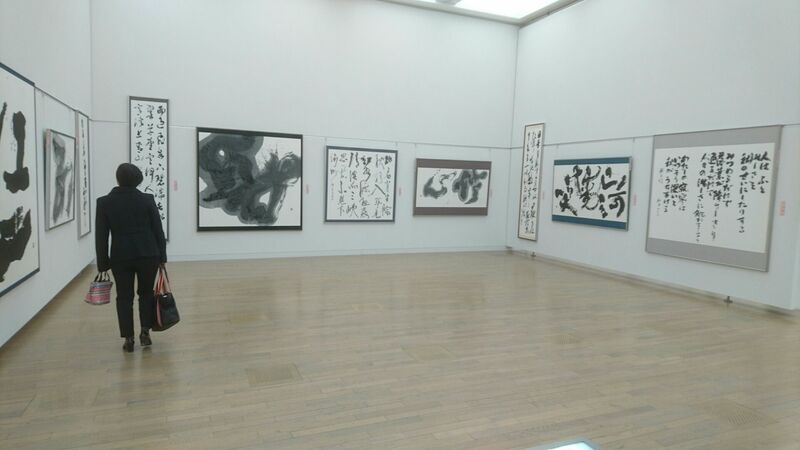 It`s the Dokuritsu Sho (Calligraphy) Exhibition, and I love it for the passion, energy and wit of its works (and its calligraphers!) – but more than that, I love it for making me “feel at home” with a world that is usually quite inscrutable for me (and many other, I assume) – the ancient art of calligraphy, using Chinese and Japanese (Kana) characters. A drive past the areas devastated by the earthquake, tsunami and nuclear disaster of 2011, inspired Naoko Oya to create this powerful work: 山河慟哭 (SANGA DO-KOKU)- The mountains and rivers (of the northeast) are wailing! 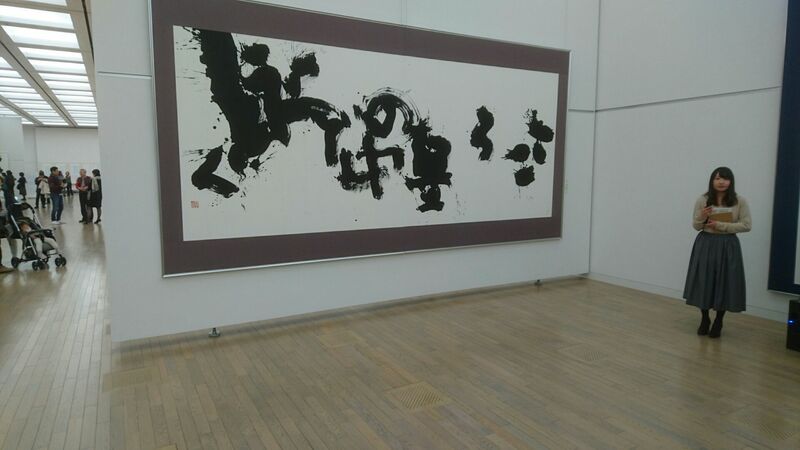 Besides moving me with its direct meaning, this work, and others like it at the the exhibition, reminded me of the traditional Japanese concept of KOTO DAMA (言霊) – the idea that words have an intrinsic life and power of their own. Long before I ever imagined that I`d be living in Japan one day, I felt drawn to oriental calligraphy- and my first encouters with it were in New York`s China-Town, where I would often for a small fee, have a “street calligrapher” write something for me and my girl-friend – our names, or some Chinese proverb or another (though we could never be sure, of course, of what he really wrote!) on a sheet of white paper. Maybe that`s why right after I arrived in Japan, as a university student, I joined a calligraphy class. And though I bought all the necessary equipment, I soon gave up the class in frustration, as the teacher did not let me wield the brush in my left hand, the one I always use for writing. 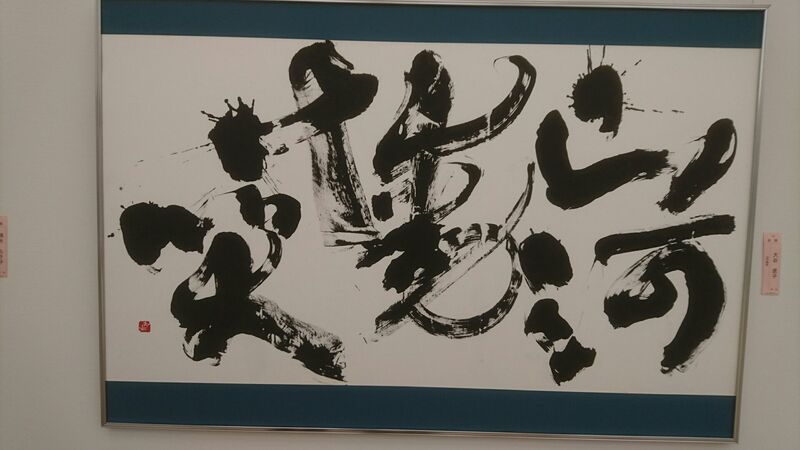 And though I had permanently given up trying to be a calligrapher, I never stopped enjoying the sight of calligraphic works. The only “problem” for me was that nearly ALL calligraphic works looked good – whether by the “Great Brushes” of Chinese or Japanese history, or by local school children. 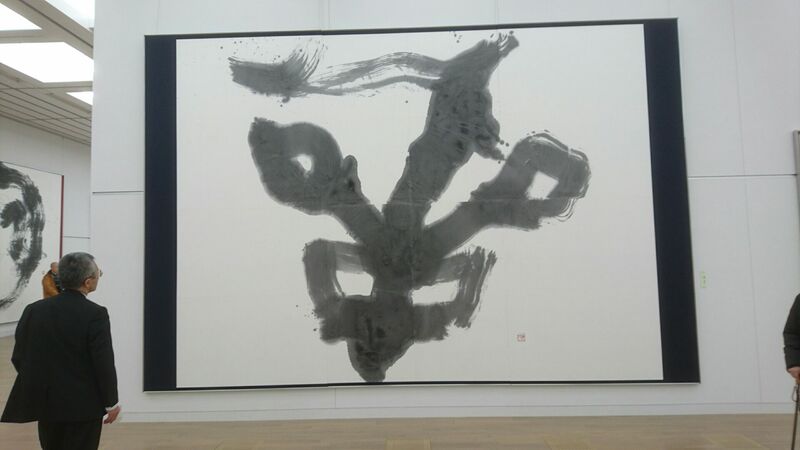 In other words, besides enoying the sight of characters renedered in black ink on white paper, I had no understanding at all of what made calligraphy good or bad. And it never got me truly excited. One of the calligraphers talking about her work: I want to swim in a world of ink! 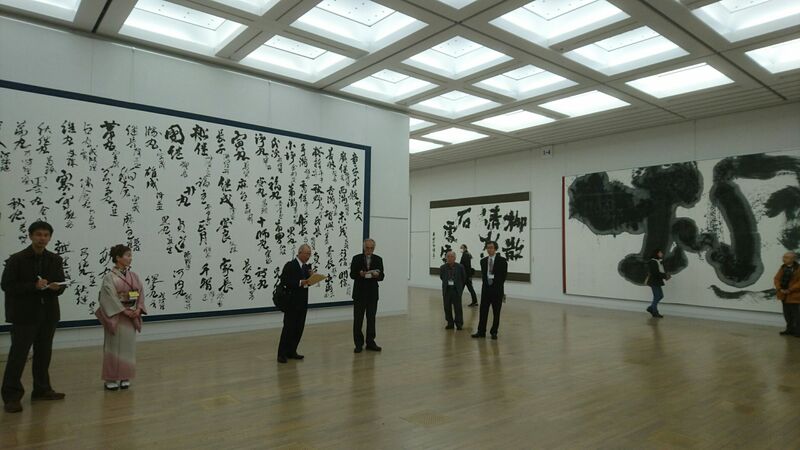 Well, all that changed when I went to my first Dokuritsu Sho Exhibition a few years ago at the New National Museum of Art in Tokyo (which on the inside looks more like an airport than a museum !). The practitioners of this particular school of calligraphy (founded in 1952), apply a very modern sensibilty to their art, while remaining firmly rooted in ancient tradition – and the results are quite stimulating. 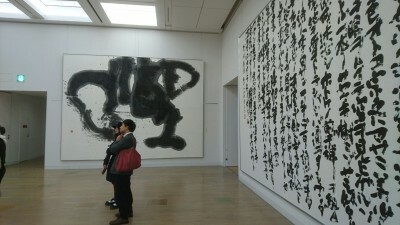 In fact, instead of being at a showing of traditional calligraphy, a visit to the Dokuritsu Exhibition is more like experiencing a first-rate showing of contemporary art. First you take in a work from a distance and form whatever first impression it might make on you. 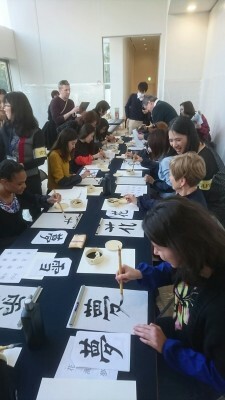 Then, you read the label to find out what word, poem, or proverb, the calligrapher has selected and worked with (usually over and over and OVER again – until the satisfactory result is obtained). Then you step back and look at it again, viewing it in light of the information the label has imparted on you. In the Dokuritsu style of calligraphy, the artist works with ink and brush to express, reflect, or re-iterate or magnify the meaning contained in the characters. Lets look at one of the works I have posted above – the one by Naoko Oya. 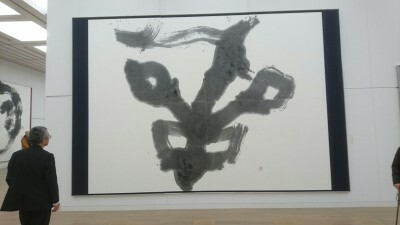 The first impression this work gives is of frenetic, frightening, energy, swirling, spitting and spewing. And since this poem is a reference to the mountains and rivers of MICHINOKU (northeastern Japan) we instantly understand the implications – this is a work about the dispersal of radiocative poisons and the subsequent lamentations of the the mountains, sky, water, trees- and local people. It is works like this one, so full of energy and power, that reminded me of a very important traditional Japanese concepts – KOTO DAMA (言霊) – the idea that words in themselves have LIFE of their own. But next January 11th thru 23rd, the 65th anniversay showing will be held- and there will be at least one day with English presentations and interpreters available. After discussion of selected works you will even be able to try your hand at writing Kanji characters with ink and brush – and once again Dokuritsu proved refreshing for me – they allowed me – at that event, at least, to use my left hand! A Road Runs Through it- right through the ruins of Tsukuba`s old Hanamuro-Jo (花室城) Fortress, that is!